Sudan has been in a state of unrest since December 19th, 2018, as the Sudanese people are protesting the worsening conditions in their country. The Sudanese President, Omar al-Bashir, has been in power since a coup d’etat in 1989 and since then, the country has been in an economic downfall. Amidst a weakening currency (In January 2009, the Sudanese Pound used to convert to $0.45 USD, and now it converts to just over $0.02 USD) and rising costs for day-to-day necessities, the anger of the people has bubbled over and manifested in the form of widespread protests. Despite being met with tear gas and other means of dispersion, protestors have continued to take to the streets, risking their lives daily, so much so that at least 40 people have been killed according to local activists. Why are the Sudanese taking to the streets? Imagine this: you want to go to the bank to take out cash from your own bank account, but you have to wait hours just to be told that there is no cash available. This is the reality for scores in Sudan at the moment. There has also been a spike in the price of bread (aesh in Sudanese Arabic which translates to the root word of life) due to shortages, and people are left with very little to no food. Uncertainty and instability have been steadily growing, and coupled with corruption, the average man has had enough. They believe that President Omar al-Bashir has had his day, and that now, power must be handed to someone willing to work for the benefit of the people. The middle class is shrinking, and people are becoming poorer. What once was a country that was on the receiving end of migrants from East Africa, is now one reeling from its own uncertainty and distress. The government of Sudan, including President Al-Bashir, are calling the protestors criminals and vandals, taking a page right out of any dictator’s handbook; a clear signifier of a man desperately clinging to power. Government forces have retaliated against the protestors by shooting live ammunition, killing at least 40 people, many of whom are students, professionals, and activists that are demanding change. There have been many calls for President Al-Bashir to step down, but he has stood his ground with utmost stubbornness. He has said that the economic problems of Sudan will not be solved by “vandalism”, once again trivializing those protesting for change by labelling them criminals. 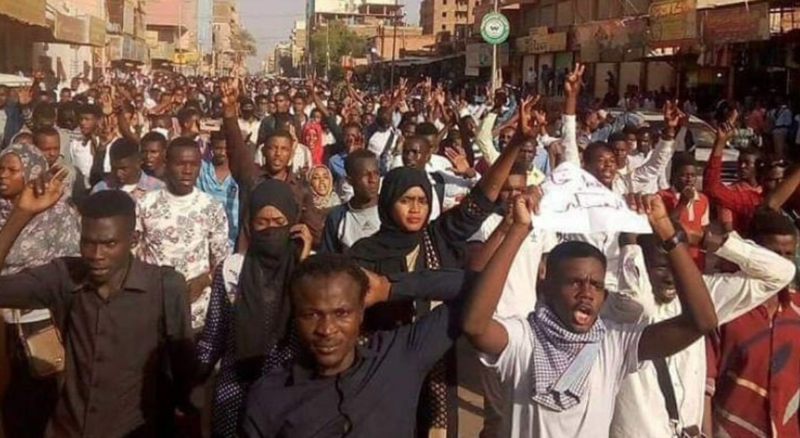 Protests started in the highly anti-government city of Atbara, situated in northeastern Sudan, where the initial days saw thousands of protestors taking to the streets. Soon after, the government forced a state of emergency and a curfew that lasted from 6:00pm to 6:00am, thus halting the ability of people to go about their daily lives, trying to earn a living to keep their families alive. Since then, the dissent has spread to Pot Sudan, followed by the country’s capital of Khartoum. Sudanese citizens and allies have also gathered in cities around the world, including Marseille, France to peacefully demonstrate their support of protestors in Sudan. The question now is, will President Al-Bashir listen to the demands of the protestors and cut his losses, or will he continue to be defiant? Either way, we pray for Sudan, for those involved in the #SudanProtests, and hope that no more lives are lost in the pursuit of safety and stability.